Capt. P.W. 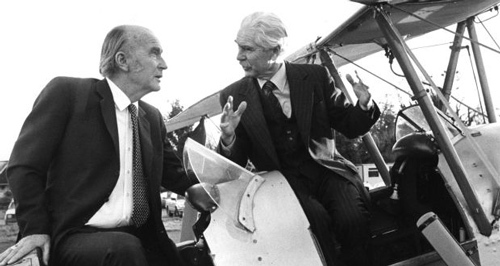 (Darby) Kennedy with President Dr Patrick Hillery in a Tiger Moth biplane. The Irish Air Line Pilots’ Association (IALPA) came into being in 1946 when a group of Aer Lingus pilots met and formed a committee, headed by the first IALPA President Captain P. W. (Darby) Kennedy. In the early days it dealt with the airline on matters of common interests, mainly the “lifestyle” items of salary, working conditions, pension and seniority. In 1953 the present Constitution was adopted which outlined key issues such as International Affiliations, salary, seniority, welfare and working conditions. Although the constitution has been amended on several occasions since then, the objectives of the organisation have not basically changed. Any changes that have been made reflect the growth of the Association and the strengthening of the contribution to the air transport industry in Ireland. In the early 1960s IALPA was registered as a trade union and in 1998, IALPA joined the IMPACT trade union. 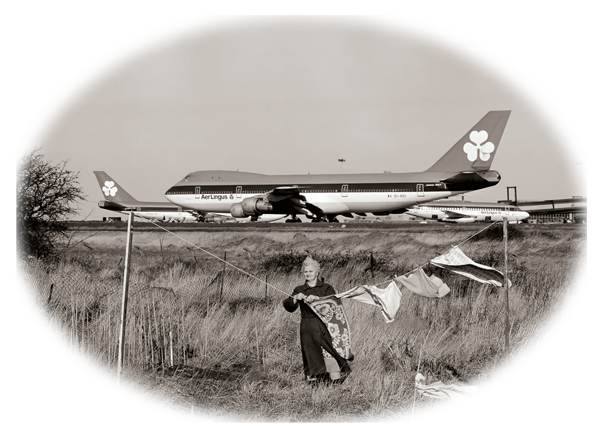 Mary Ryan doing her washing just outside Dublin airport in the 1970s. At the outset IALPA started by meeting in various places – homes, halls and hotels, before it was recognised that the business was of such a nature that more permanent accommodation was required. In the early 1960s the Association rented office space in Dublin in the Headquarters of the Workers Union of Ireland (WUI), to which it was affiliated until the late 1970s. As the Association’s title implies, IALPA currently draws its membership from all airlines in Ireland -i.e., Aer Lingus, ASL Airlines, CHC (Ireland), CityJet, Irish Helicopters, Parc Aviation, Ryanair, Stobart Air, and Westair. IALPA was one of the founding members of IFALPA, the International Federation of Airline Pilots’ Associations. Captain Michael Cusack of IALPA attended the founding meeting in London in 1948. The second IFALPA conference was held in Dublin in 1949. The Conference Chairman at that conference was Captain J.N. McAuley of IALPA in the absence of the IFALPA President, Capt. Dave Behnke of US ALPA. IALPA has had three members elected as President of IFALPA. This is a remarkable achievement for what is a relatively small association. Those three IALPA members were Captains J.J. O’Grady, R.f. Tweedy and E.A. Murphy. Mention should also be made of Captain Eric Jackson who served as IFALPA Secretary in 1958-60 and as vice-President from 1960 to 1962. Jim O’Grady trained in the Air Corps and was active in IALPA from early on in his career in Aer Lingus. He was President of IALPA in 1965-67. He was first elected to the IFALPA Board as Principal Vice-president responsible for Administration and Finance in 1968. He served in that position until he was elected as President at IFALPA’s annual conference in Tokyo in 1973. He was re-elected for another two-year term at the Vienna conference in 1975. Jim O’Grady’s main contribution to IFALPA was in the administrative field where he was instrumental in modernising the secretariat and establishing proper accommodation for the Federation at Egham, outside London. Bob also started his flying career in the Air Corps. Bob is probably unique among IFALPA Presidents in having been President of 3 pilot bodies, IALPA, Europilote and IFALPA. (Europilote was the regional organisation of European Pilot’s Associations and was the precursor of the European Cockpit Association (ECA)). Bob was President of IFALPA in 1981 to 1985. He was President of Europilote (1976-80) and was President of IALPA in 1987-88. The most noteworthy event during Bob’s term in IFALPA was the shooting down of the Korean 747 by the Soviet air force in September 1983. Not surprisingly this action outraged the world’s airline pilots and Bob became a regular on international TV news programmes where he highlighted the need for the international community to take decisive action to prevent such outrages in the future. Ted Murphy trained as a cadet pilot with Aer Lingus in the 1960s. He became active in IALPA from the 1970s and served for many years as Chairman of the Safety and Technical Committee. While on Special Leave Ted worked for three years for ICAO, based in Montreal. He was elected President of IALPA in 1989 and for a second term in 1991. Ted was involved in IFALPA technical committees from the 1970s and was elected as IFALPA Principal Vice-President-Technical and as Deputy President before being elected President in 1999 and was re-elected President in 2001. Ted was President when the terrorist attacks of 9/11 occurred and was intimately involved in ensuring that the response of the international community was appropriate to the event and did not damage effective security measures nor hinder the growth of the industry. Jim O’Grady (1978), Bob Tweedy (1986) and Ted Murphy(2004) were all the recipients of awards from the Federation in recognition of their contribution.